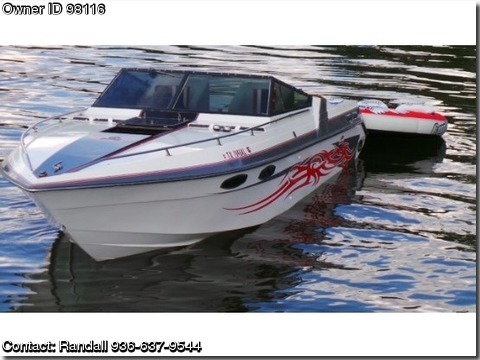 Please contact the owner directly @ 936-637-nine five four four…1987 Chaparral 285 XLC, 1987 Chaparral twin 350 mag MerCruiser new top ends at the end of 2012 vortex heads,intakes,carbs .Too much to list. Thru hull Stainless Marine exhaust &amp; water system . Alfa 1 drives , one new &amp; under warranty ,drive showers, stainless Solas 21 pitch propsSink ,toilet &amp; fridge in cabinThis boat will turn heads &amp; has that go fast sound that keeps them looking with the room to haul the wife &amp; kids to the beach and pull that 3 man tube. 2007 aluminum 3 axle Ace trailer with disc brakes &amp; torsion axles (I have a 2 axle galvanized roller trailer that the boat came on that can be swaped under it if You need to work on the price) $25000, may trade for nice pontoon boat.